People diagnosed with Autism Spectrum Disorders (ASD) have impaired social interaction and communication, needing special instruction from parents and teachers. As more and more children are diagnosed, the need for effective interventions grows. Yet, when we searched for resources to aid in the development of social skills, much of what we found was expensive and copywritten. 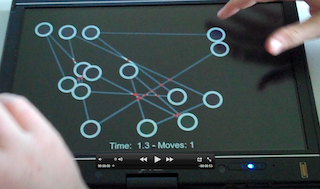 To fill this gap, we propose a set of activities developed for software on a multitouch computer. Many with autism have a natural interest in computers, yet computers are usually used by one person at a time. The activities we designed for a multitouch tablet are social and involve face-to-face interactions. Because we want parents and teachers to be able to use this technology widely, we are making it free and open source. The software can be downloaded for free, and experienced programmers may modify the code we have posted online. In addition, the software runs on commoditized, commercially available hardware. If you are interested in using our software, please first read our general advice on how to best conduct activities with children. The multitouch applications do not promote social interaction by themselves, but if used in the context of pro-social activities, they do. You may browse through our activities, and download the necessary software. To run the activities, you must first have a multitouch tablet, which we discuss in our frequently asked questions page.